The road trip to the Washington State campus has long been a difficult trek for all Pac-10 teams. The remoteness of the campus in far eastern Washington typically requires multiple stops and layovers. But this year, the trip will be a little easier for the Bruins who will be flying direct to Pullman from Los Angeles on Wednesday. "For the first time since I've been here, we're actually chartering a flight right into Pullman." 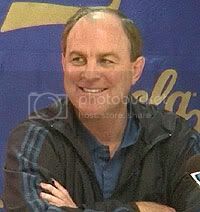 UCLA Coach Ben Howland said at his weekly press conference. "It has always been so grueling to get there." The UCLA basketball team will be hopping on a thirty passenger turbo-prop airplane at Hawthorne Airport for the flight up north. "It has taken us ten to eleven hours to get there in the past - twelve total hours from the time we leave Pauley Pavilion," Howland said. On the topic of Luc Richard Mbah a Moute's sprained ankle, Coach Howland mentioned at the pressor how much the team will miss the presence of Mbah a Moute on both ends of the court this week against the Washington schools. "He turned his ankle pretty good on that play. We don’t expect him to play in either game this week," Howland said. Luc is one of our best defensive players, he always guards one of the other team’s best offensive player. Whenever he’s out - it’s a big hit for the team." "I was so depressed when I learned he (Luc) was out this week," Howland said. "It's hard to express. Its very disappointing." Both freshman Chace Stanback and sophomore Nikola Dragovic are expected to play increased minutes in the absence of Mbah a Moute during this road trip. Howland said he has been impressed with Dragovic's defensive effort of late. "He's trying real hard to stay in front of the ball," Howland said. "He can't apply the type of ball pressure like Luc, but he has to be smart on defense." The UCLA coach gleamed with pride when he told the press about senior Lorenzo Mata-Real's recent academic success. "The great news about Lorenzo is that he tested out of Spanish. It is one less class he'll need for graduation." Not to diminish any academic accomplishment, but I thought Spanish was Lorenzo's first language (no, not just because of his name). To test out, don't you only need to pass the first couple classes which I would assume a native speaker could easily do? I think he said "ten to eleven hours" and not "flights." It's usually a two flight hop to Spokane. Give credit where its due. There is also a written aspect to testing out of a language. I know many native English speakers who would not test out of college English due to sub-par writing skills or simply poor grammar. Same would go with any language. Agree with JonW...Huge difference in verbal vs. written skills. I remember being astonished when some of my Latino friends were in the same Spanish language classes as me at UCLA. Of course, verbally, they were perfectly articulate. But when it came to written grammar, (correct verb-conjugation, predicate usage, gerunds, etc...), both of us were lost. Testing out of any language (verbal and written) at UCLA is extremely difficult. Great work Mata! Dont be so naive. Just because someone can speak a language doesn't mean the can read and write too. Just think of all the illiterate native english speakers we have in the US! Ive taken that Spanish exam-- not an easy feat!